We have found that a number of our customers are canning and providing home-made products to their local grocery store for resale. This type of merchandise is very popular with shoppers. There is a uniqueness and fresh flavor in homemade jellies or relishes. 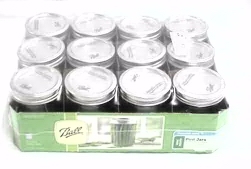 They find that the commercial type jars that we sell tend to give the products a professional appearance and save money over the consumer type jars that are generally available to the home canner. 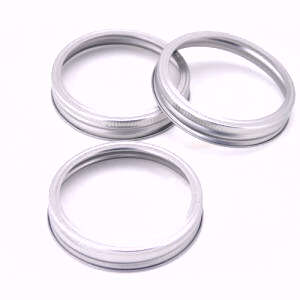 These lids are not designed to be heated in a canner or pressure cooker but do fine when the hot product is in contact with the inner part of the lid by inverting the jar while the jelly is still hot enough to kill any bacteria inside the lid. The jars below are actually clear. We found that clear jars didn't photograph well so we filled them with tea. The prices quoted are for empty jars, there is an extra charge for tea. Mason Jars for Preserving. 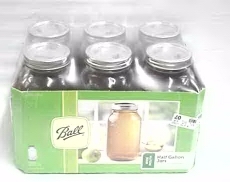 12 pint jars with lids and bands for home canning. Mason Jars for Preserving. 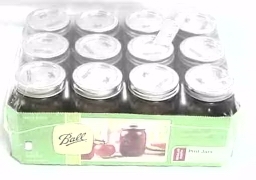 12 quart jars with lids and bands for home canning. Mason Jars for Preserving. 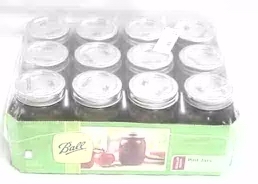 6 1/2 gallon jars with lids and bands for home canning. Needed with all jars with glass lids. Directions: Boil for 15 minutes prior to using. For Vegetable Processors -Click Here! 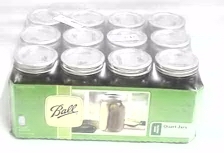 For Canning Tools -Click Here! 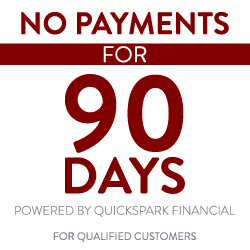 For Pressure Cookers -Click Here!